White Makeup Organizer with 8 compartments and three drawers! The biggest benefit to having a makeup organizer is that you can keep all of your products separated and neatly organized. We can all agree that putting on your makeup is a lot more pleasurable when you can just take what you need and get right to it. An organizer keeps everything within easy reach. When you can see everything you have at a glance, you can also create better looks and experiment. Whether your makeup collection is big or small, you can benefit from having a designated cosmetic organizer. Are you still storing your makeup in bags and clunky makeup cases? If so, it may be time to upgrade to a cosmetic organizer. 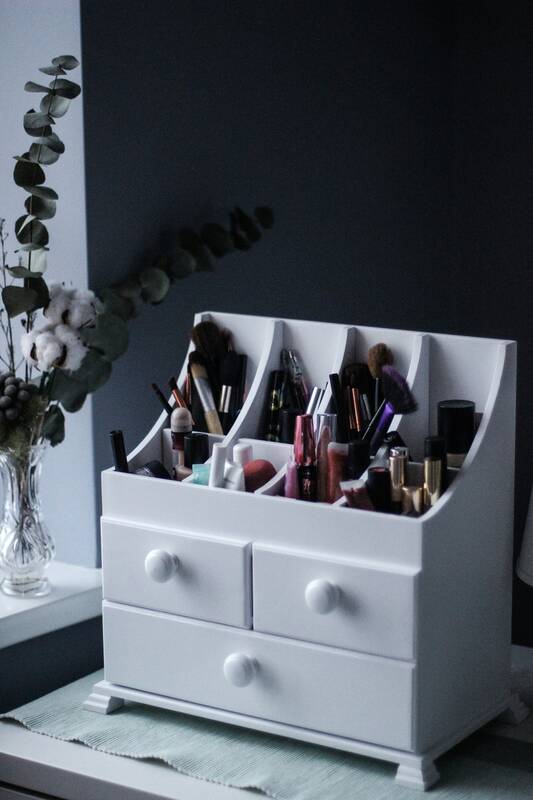 These tabletop storage solutions have several drawers to keep your makeup organized and tidy. It can be a wonderful and at the same time very practical gift for a special woman in your life. Height - 38см/15.2inches, Width - 33.5cm/13.4inches, Depth - 18cm/7.2inches. Made of plywood. 100% handmade. We don't offer special gift wrapping, although we can add a short gift note to the packing. Please include the inscription in the "note to seller" box when you check out. • wash gently and quickly with soap and lukewarm water. Avoid soaking. • let it dry completely. !! !Each buyer gets coupon codes emails and 10% discount for next orders!!! Need gift ideas for your mom, sister, wife or a girlfriend? Makeup organizer Is a win win !! !Mother’s Day Sale 10% off. Only till April 23. Hurry up!!! Lovely and thank you. Shipping was prompt. The owner of this shop is so talented! I purchased the entire furniture set a couple of years ago and ordered this recently. It's absolutely gorgeous! Thanks for a lovely, beautiful well designed miniature furniture! We love it! Our daughter loves it! I love custom orders! I will happily create something fun and new, just for you! Due to the nature of these items, however, custom creations can not be returned or exchanged. Personalize your wooden toy with anything you want. Please specify your personalization in the "note to seller" when you check out and the grammar will appear just as specified. Don't see something you were looking for? Send us a message and we will be happy to create a new custom item for you! • lightly sand with fine sandpaper unpainted areas.